The aim of this study was to evaluate the changes in the brain of albino rats treated with profenofos and the possible protective effect of vitamins C and E against the acute effect of profenofos. During the last decades the use of pesticides has increased steadily in developing countries in an effort to increase food production and control vector-borne diseases in plants. Organophosphorus (OP) compounds are widely used in agriculture as insecticides. OP poisoning is common due to its wide availability. Profenofos is a widely used insecticide and has been classified as moderately hazardous. OP pesticides are known to inhibit cholinesterase activity in target tissues. Oxidative stress is one of the possible mechanisms that could be involved in OP toxicity. Eighty adult male albino rats were divided randomly into four main groups: the control group (I), the profenofos toxicity group (group II), the profenofos + antidote-treated group (group III), and the profenofos + antidote + antioxidant-treated group (group IV). Each treated group was divided equally into two subgroups. Ten rats from each subgroup were killed after 24 h to demonstrate the toxicity. The other 10 rats were killed after 7 days to demonstrate the recovery. Brain samples were obtained for biochemical, histopathological, and immunohistochemical studies. Acute exposure to profenofos causes biochemical and histopathological changes in brain tissue. These changes were minimized with atropine and oxime treatment. However, this recovery was more prominent in the group administered vitamins C and E.
Treatment with vitamins C and E exerts an antioxidative effect and this may be responsible for the amelioration of profenofos-provoked toxicity. Organophosphorus compounds (OPCs) are the most commonly used compounds globally to get rid of insects and pests . The primary mechanism of action of organophosphorus (OP) insecticides is the inhibition of acetylcholinesterase, which degrades the neurotransmitter acetylcholine into choline and acetic acid . Subsequent accumulation of acetylcholine at synapse causes an initial overstimulation followed by the exhaustion and disruption of neurotransmission in both the central nervous system (CNS) and peripheral nervous system . Profenofos [(O-4-bromo-2-chlorophenyl) O-ethyl S-propyl phosphorothioate] is a widely used insecticide for the control of various caterpillars, white fly, and mits on cotton and vegetable crops . Profenofos has been classified as a moderately hazardous (toxicity class II) pesticide by WHO and it has a moderate order of acute toxicity following oral and dermal administration . Atropine and oximes are the fundamental medicines used in the treatment of OP intoxications. Atropine blocks muscarinic receptors in the peripheral and CNSs, crosses the blood–brain barrier, and is widely used in OP poisonings. Oximes reactivate actylcholinesterase, which has been inhibited by organophosphates (OPs) . Oxidative stress is defined as an imbalance between the production of free radicals and reactive metabolites, so-called oxidants or reactive oxygen species, and their elimination through protective mechanisms, such as the action antioxidants. This imbalance leads to the damage of important biomolecules and cells, with potential impact on the whole organism . Under normal circumstances, the body has effective antioxidant systems to combat the menace of oxidative stress. However, in extreme oxidative challenge, such as those observed in pesticide poisoning , the body's antioxidant machineries are overwhelmed. Therefore, under this circumstance, there is a need to supply the body with exogenous antioxidants . The brain is the most vulnerable organ to oxidative damage due to its biochemical and physiological properties. It consumes an inordinate fraction (20%) of total oxygen consumption for its relatively small weight (2%) of body weight. In addition, it is not particularly enriched in antioxidant defenses in comparison with other tissues . The high content of polyunsaturated lipids, the most susceptible to oxidation due to the presence of double bonds of unsaturated fatty acids, which are hot spots for attack by free radicals, initiates cascade or chain reaction, damaging neighboring unsaturated fatty acids. In addition, there are regionally high concentrations of redox-active transition metals (e.g., iron) capable of the catalytic generation of ROS . Vitamins C and E act as potent antioxidants. Although both vitamins serve as free radical scavengers in the biological system, vitamins C and E have been shown to act synergistically as antioxidants . Vitamin E acts in the lipid component of the membrane to prevent lipid peroxidation; vitamin C is hydrophilic and exerts its effect in the extracellular space, trapping radicals in the aqueous phase ,. Furthermore, vitamin C has the capability to regenerate tocopherol from tocopheroxyl radicals in the biomembranes. Thus, vitamins E and C have interactive effects. These two nutrients can be effective partners in reducing the destructive process of lipid peroxidation . This study aimed to evaluate biochemical, histopathological, and immunohistochemical changes in the brain of albino rats treated with profenofos and the possible protective effect of vitamins C and E against the acute effect of profenofos. Eighty adult male albino rats weighing 150–200 g were obtained from animal breeding house in Menoufia University. They were housed in cages under standardized temperature, humidity, and light conditions. They were fed the standard diet and water. Rats were acclimatized for 1 week before experiment and were divided equally into four main groups. Rats were kept under the same conditions without administering OP or any treatments. The control animals received the same volumes of the solvents used for the treatment of other toxicity groups (corn oil). Profenofos was administered at a single sublethal oral dose of 20 mg/kg (1/10 LD50). The LD50 value of profenofos is 200 mg/kg according to Hamza et al. .
Profenofos was administered at a single oral dose of 20 mg/kg. Thereafter, 17 mg/kg atropine and 30 mg/kg of toxogonin were administered intraperitonially . Profenofos was administered, and then atropine and toxogonin were administered as mentioned above. The animals were treated concomitantly with 200 mg/kg of vitamin C and 150 mg/kg body weight of vitamin E once daily for 7 days orally . Profenofos was applied as a commercial emulsified concentrate (EC) formulation containing 72% EC. Profenofos (trade name Coracron) is supplied by El-Helb Co. for the Pesticide and Agrochemical (1st Industrial zone, New Damietta City, Egypt). The EC was emulsified in water just before use and orally administrated to animals with a stainless steel curved needle. The dose was calculated according to the weight of each animal. Tablets of vitamin C and capsules of vitamin E were used in this study. Vitamins E and C were solubilized in corn oil and distilled water solvents, respectively. The dose was calculated according to the weight of each animal and orally administrated to animals using a stainless steel curved needle. 10 rats were killed after 24 h to demonstrate the toxicity. 10 rats were killed after 7 days to demonstrate the recovery. Brain samples from the control and the experimental group were obtained and divided into two parts. The first part was homogenized. Tissue samples were prepared by homogenizing 1 g of tissue in 10 ml of phosphate buffer (pH 7.4) using a manual glass homogenizer. The unbroken cells and cell debris were removed by means of centrifugation at 3000 rpm for 10 min at 4°C. The obtained supernatants were stored at −20°C until biochemical assays. The second part was immediately immersed in 10% buffered formalin fixative for 48 h and then was sent to the histology laboratory of Menoufia Faculty of Medicine. The specimens were processed to obtain paraffin blocks, from which 5-μm-thick sections were prepared and processed for histopathological and immunohistochemical studies. Haematoxyline and eosin stain was used . Immunohistochemical study for glial fibrillary acidic protein (GFAP) was carried out . Immunostaining was performed using the avidin–biotin peroxidase technique for localization of GFAP to demonstrate the astrocytes. Five-micrometer-thick paraffin sections mounted on coated slides were deparaffinized and treated with 0.01 mol/l citrate buffer for a few minutes to unmask antigens. The sections were incubated in H2O2 for 10 min to abolish endogenous peroxidase activity. Thereafter, the sections were hydrated, washed, heated in buffered citrate, and incubated for 30 min with horse serum for 2 h at room temperature to inhibit nonspecific immunoreactions. Primary monoclonal anti-GFAP serum was applied at 1: 5000 dilutions. The sections were incubated with primary monoclonal antiserum for 36 h at 4°C. After washing, they were incubated with biotinylated secondary antibodies for 5 h, followed by addition of the avidin–biotin peroxidase complex. Finally, the immune reaction was visualized with 0.05% diaminobenzidine. The slides were counterstained with hematoxyline before mounting. Negative controls: Incubations were carried out with the omission of the primary antiserum; consequently, no immunostaining occurred. Cholinesterase activity was determined using the method of Ellman et al. .
Catalase (CAT) activity was assayed using the method of Aebi . The mixture was prepared by adding to a cuvette containing 0.5 ml of 50 mmol phosphate buffer (pH 7.0), 0.1 ml of sample, 0.5 ml of 30 ml of freshly prepared H2O2, and distilled water to make a total volume of 1.5 ml. The rate of decomposition of H2O2 was measured spectrophotometrically at 240 nm. The statistical analysis of data was performed using Excel and SPSS programs statistical package for social science (IBM Corporation, Armonk, New York, United States), version 22 on personal computer. Data were presented in the form of mean ± SD. The analysis of the data was performed to test statistically significant difference between groups. For quantitative data, the F-test was used to compare more than two groups, and then least significant difference was used to compare between two means. A P value less than 0.05 was considered statistically significant [Table 1]. The animals in the control group did not show any apparent signs of toxicity. Rats that were orally administered profenofos showed signs of toxicity related to cholinesterase inhibition (miosis, lacrimation, salivation, muscle tremors, muscle weakness, and diarrhea), which decreased both in intensity and frequency with passage of time. Observed improvement occurred with atropine and oxime treatment. However, this improvement was more prominent in the group administered vitamins C and E. No mortality occurred throughout the experiment. Brain cholinesterase activity of group II was lower than that of the controls, and the difference was statistically highly significant. The activity of group III was higher than that of the poisoned animals of group II with more elevation in group IV. After a week, the activity did not show statistical differences between the groups. The percentages of activity were 90.56% in group II, 91.58% in group III, and 98.15% in group IV. After 24 h, the results showed elevation of CAT activity (130.86%) in OP-exposed rats, with lower values in groups III and IV (122.78 and 111.23% respectively). The values of activity after 7 days showed downward tendency toward control values. The activity in group II was 121.75 and 110.05% in group III, with nearly normal values in the animals of group IV (103.57%). The addition of vitamins C and E to routine treatment caused a significant decrease in CAT activity in relation to group II. Sections from group I (control) showed normal appearance of the cerebral cortex [Figure 1]a. Exposure to profenofos in group II showed important degenerative changes in brain tissue in the form of congestion of cerebral blood vessels, edema vacuolations, and severe cellular infiltration, which were evident after 24 h [Figure 1]b. Figure 1: A photomicrograph showing the cerebral cortex in different groups of rat after 24 h. (a) The control group showing normal appearance of the nerve cells. (b) Group II showing vascular congestion (red arrow), vacuolations (bent arrow), and severe cellular infiltration (green arrow). (c) Group III showing vascular congestions (red arrow), vacuolations (bent arrow), and cellular infiltration (green arrow). (d) Group IV showing less cellular infiltration (green arrow) around vascular congestion (red arrow) and vacuolations (bent arrow) (haematoxyline and eosin ×400). Rats treated with antidotes showed less degenerative changes. The brain showed less congestion and less edema with less infiltration [Figure 1]c. Marked improvement was observed in the animals of group IV, which were treated with a combination of antidotes and vitamins [Figure 1]d. The least cellular infiltration was observed in group IV. Seven days after the intoxication, the sections from the control group showed normal appearance of the cerebral cortex [Figure 2]a. In group II, it was observed that structural changes were regressed. Mild vascular congestion and persistent vacuolation were noted [Figure 2]b. 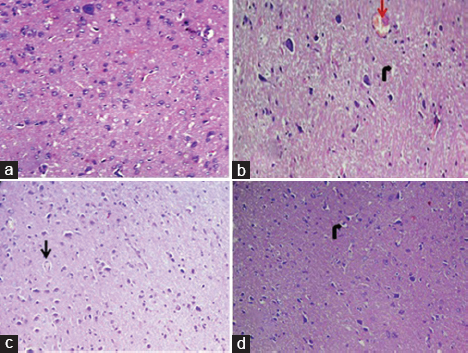 Sections from group III showed mild vascular congestion and little perivascular edema [Figure 2]c. In group IV, nearly normal morphological appearance of nerve cells was observed with residual fine vacuolations [Figure 2]d.
Figure 2: A photomicrograph showing the cerebral cortex in different groups of rat after 7 days. (a) The control group showing normal appearance of the nerve cells. (b) Group II showing mild vascular congestions (red arrow) and persistent vacuolations (bent arrow). (c) Group III showing mild vascular congestion (red arrow) and little perivascular edema (black arrow). (d) Group IV showing nearly normal morphological appearance of nerve cells with residual fine vacuolations (bent arrow) (haematoxyline and eosin ×400). Astrocytes did not express GFAP at immunohistochemically detectable levels, or express only very low levels in the control group [Figure 3]a and [Figure 4]a, whereas they showed positive immunoreaction for GFAP in the profenofos toxicity group after 24 h [Figure 3]b. Figure 3: A photomicrograph showing the immunohistochemical staining of antiglial fibrillary acidic protein (GFAP) expression of the cerebral cortex in different groups of rat after 24 h. (a) Control group: astrocytes do not express GFAP at immunohistochemically detectable levels, or express only very low levels. (b) Group II: brown color cells with branching processes (astrocytes) (arrow head) with positive immunoreaction for GFAP. (c) Group III showing moderate GFAP immunohistochemical staining. (d) Group IV showing weak GFAP marking (GFAP ×400). 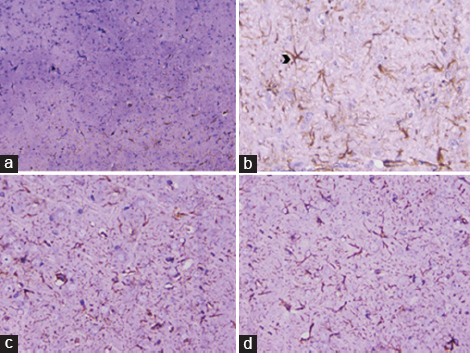 The animals treated with antidotal therapy showed less prominent GFAP immunohistochemical staining compared with the OP group [Figure 3]c. Vitamins C and E administered to rats in group IV caused weak GFAP marking after 24 h [Figure 3]d.
After 7 days, the sections of rat cerebral cortex treated with OP showed strong positive immunoreactivity with extensive overlapping and interdigitations of processes of astrocytes [Figure 4]b. Antidotal therapy caused less astrocytic density compared with the OP group with moderately reactive astrocyte processes, which do not overlap [Figure 4]c. Addition of antioxidants showed GFAP marking nearly similar to the control group [Figure 4]d.
Figure 4: A photomicrograph showing the immunohistochemical staining of antiglial fibrillary acidic protein (GFAP) expression of the cerebral cortex in different groups of rat after 7 days. (a) Control group (b) group II showing strong positive immunoreactivity. Extensive overlapping and interdigitations of processes of astrocytes (arrow head) were noted. (c) Group III showing less astrocytic density with moderately reactive astrocyte processes. (d) Group IV showing GFAP reaction nearly similar to the control group (GFAP ×400). Acute poisoning by OPCs is a major global clinical problem, with thousands of deaths occurring every year. Most of these pesticide poisoning and subsequent deaths occur in developing countries following a deliberate self-ingestion of the poison . The manifestations observed in the rats exposed to profenofos were consistent with cholinesterase inhibition that supported the common acute toxicity mechanism of organophosphate poisoning. The cholinergic signs were more severe in the OP-treated group compared with groups III and IV. This revealed the ability of the vitamins to mitigate toxic signs induced by OP. This finding is in accordance with the results obtained in an earlier study by Ambali et al. . Brain cholinesterase of rats that received profenofos was inhibited, and this is in agreement with the work of Khalil et al. . Combined administration of profenofos and antidotes showed an increase in brain cholinesterase activity. Karasova et al. reported that obidoxime in combination with atropine was able to increase cholinesterase activity in brain tissues against tabun inhibition. Lugokenski et al. also demonstrated that obidoxime had a protective effect on methamidophos-induced cholinesterase inactivation in rat brain homogenate. The most pronounced beneficial effect was observed in rats treated with additional vitamins C and E suggesting their neuroprotective property. After a week, cholinesterase returned to normal in treated groups. Brain cholinesterase activity did not show statistical differences compared with control values. This is in line with the finding reported by Raszewski and Filip , who studied the application of obidoxime alone or in combination with atropine and diazepam after chlorfenvinphos intoxication. The activity of CAT increased significantly in the brain, which was attributed to the stimulation of antioxidant defense system, and this is in agreement with the findings of Mansour et al. .
As regards in-vitro evaluation of neurotoxicity, Colović et al. illustrated that diazoxon (oxidation product of diazinon) significantly increased rat brain CAT in a dose-dependent manner. The intensity of the changes reported in the current study was particularly evident at the beginning of the experiment, whereas its decrease in the later period was caused by the adaptation to the conditions created by the stress. This was proved by Spodniewska et al. as well. In OP toxicity, oxidative stress is an important pathophysiological mechanism, especially for neurotoxicity and cerebral damage . 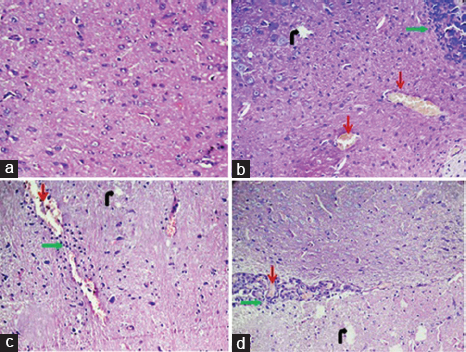 Histopathological examination of cerebral cortex sections taken from group I (control) and stained with haematoxyline and eosin showed normal appearance of the nerve cells with no pathological alterations. In group II (OP toxicity), histopathological examination of cerebral cortex cells revealed clumping of chromatin of their nuclei giving rise to the formation of some pyknotic (dense) nuclei of nerve cells. Cellular infiltration and neuron necrosis were observed after 24 h suggestive marked cerebral inflammation. These changes were also observed by Sharma et al. , who demonstrated the effect of acute exposure of dimethoate, which is another OPC, after 24 h.
Acute exposure to profenofos causes severe degenerative changes in brain tissue. These changes were minimized with atropine and oxime treatment. Yadav et al. found that the severity of lesions in OP-exposed rats treated with pralidoxime and atropine was minimized compared with OP-exposed rats. However, this recovery was more prominent in the group administered vitamins C and E.
It was observed that structural changes were much regressed after antioxidant administration. Cerebral cortex sections of the animals treated with antidotes and a combination of vitamins C and E exhibited marked improvement with almost normal morphological appearance of nerve cells with only residual fine vacuolations after 7 days. This was reported by El-Hossary et al. as well. As time elapsed from the intoxication, it was observed that structural changes were regressed. The abnormalities diminished and very few significant changes were evident 7 days after the intoxication. This is in agreement with the findings observed by Shrot et al. .
Astrocytes respond to all forms of CNS insults through a process referred to as reactive astrogliosis, which has become a pathological hallmark of CNS structural lesions. An increase in GFAP indicates activated astrocytes at the site of injury. GFAP has become an ideal marker for immunohistochemical identification of astrocytes . Many mature astrocytes in healthy CNS tissue do not express detectable levels of GFAP. In mild or moderate reactive astrogliosis there is a variable upregulation of expression of GFAP, as well as hypertrophy of cell body and processes without overlap of processes of neighboring astrocytes. There is little or no astrocyte proliferation. In severe astrogliosis there is pronounced upregulation of expression of GFAP, together with pronounced hypertrophy of cell body and processes, as well as astrocyte proliferation, resulting in considerable extension and overlapping of neighboring astrocyte processes . GFAP is a cytoplasmic filament protein found in astrocytes. They maintain the structural integrity of astrocytes, especially when these cells undergo hypertrophy and hyperplasia in response to CNS injury, whereby the expression of GFAP is upregulated . Immunoreactivity for GFAP was present in various degrees in different treated groups. The changes revealed longer and more numerous astrocytic processes in the brain tissues of OP-treated group as compared with controls, which do not express detectable levels of GFAP. Findings of Lim et al. suggested that GFAP expression is upregulated with dermal exposure to a low dose of chlorpyrifos. OP-induced neuronal injury was accompanied by an early astroglial activation characterized by increased GFAP protein within 24 h. GFAP upregulation was seen and continued to increase for up to 7 days. This also was recorded by Liu et al. . The immunohistochemical changes were also observed in the brain sections of antidote-treated group but were less pronounced with less astrocytic density. Ho et al. reported that GFAP is a sensitive and early biomarker of neurotoxicity, its upregulation preceding anatomically perceptible damages in the brain. It has been suggested that the rapid increase in GFAP immunoreactivity after OP exposure results from astrocytic swelling leading to cytoskeletal changes that expose GFAP antigenic sites. Delayed upregulation of GFAP is mediated by transcriptional mechanisms and/or astrocyte proliferation . Diminished GFAP immunoreaction in the group treated with antioxidants was observed when compared with the OP-treated group. Similar results were recorded by Newairy and Abdou . Because there is little or no reorganization of tissue architecture, mild or moderate reactive astrogliosis exhibits the potential for resolution in which the astrocytes return to an appearance similar to that in healthy tissue . Apart from antioxidant effect, other nonantioxidant-related effect of the vitamins may have been involved in the tissue protective effect. Previous studies showed that vitamins C and E increased the activity of paraoxonase ,, which is involved in the detoxification of OP compounds. Vitamins C and E have neuroprotective influence and decrease neuronal death ,. The present study suggests a beneficial role of vitamins C and E. Both are able to prevent the formation of unwanted free radicals and compensate or repair brain damage against the harmful effects of profenofos by improving the antioxidant defense system and providing effective protection. The authors are very grateful to Dr Rania Yassien, Professor of histology, Faculty of Medicine, Menoufia University for helping in the interpretation of the histopathological sections. Shafiullah M. Organophosphorus compounds and teratogenecity/embryotoxicity-viewpoint. J Environ Immunol Toxicol 2014; 1:22–25. Sutcu R, Altuntas I, Yildirim B, Karahan N, Demirin H, Delibas N. The effects of subchronic methidathion toxicity on rat liver: role of antioxidant vitamins C and E. Cell Biol Toxicol 2006; 22:221–227. Hussain AM, Sultan T. Organophosphorus insecticide poisoning: management in surgical intensive care unit. J Coll Physicians Surg Pak 2005; 15:100–102. Zaki NI. Evaluation of profenofos intoxication in White rats, forests. Nat Sci 2012; 10:67–77. Farrag AH, Shalby SEM. Comparative histopathological and histochemical studies on IGR, lufenuron and profenofos insecticide albino rats. J Appl Sci Res 2007; 3:377–386. Eddleston M, Buckley NA, Eyer P, Dawson AH. Management of acute organophosphorus pesticide poisoning. Lancet 2008; 371:597–607. Halliwell B, Gutteridge JM. Free radicals in biology and medicine. 4th ed. New York, NY: Oxford University Press, Oxford; 2007. p. 851. Saxena R, Garg P. Vitamin E provides protection against in vitro oxidative stress due to pesticide (chlorpyrifos and endosulfan) in goat RBC. Bull Biosci 2010; 1:1–6. Shittu M, Ayo JO, Ambali SF, Kawu MU, Salami SO. Vitamin E mitigates chronic chlorpyrifos-induced oxidative changes in pituitary glands and testes in Wister rats. Am J Applied Sci 2012; 9:75–82. Uttara B, Singh AV, Zamboni P, Mahajan RT. Oxidative stress and neurodegenerative diseases: a review of upstream and downstream antioxidant therapeutic options. Curr Neuropharmacol 2009; 7:65–74. Sayre LM, Perry G, Smith MA. Oxidative stress and neurotoxicity. Chem Res Toxicol 2008; 21:172–188. Achuba FI. Effect of vitamins C and E intake on blood lipid concentration, lipid peroxidation, superoxide dismutase and catalase activities in rabbit fed petroleum contaminated diet. Pak J Nutr 2005; 4:330–335. Sulak, Altuntas O, Karahan I, Yildirim N, Akturk B, Yilmaz O, et al. Nephrotoxicity in rats induced by organophosphate insecticide methidathion and ameliorating effects of vitamins E and C. Pest Biochem Physiol 2005; 83:21–28. Durak D, Uzun FG, Kalender S, Ogutcu A, Uzunhisarcikli M, Kalender Y. Malathion induced oxidative stress in human erythrocytes and the protective effect of vitamins C and E in vitro. Environ Toxicol 2009; 24:235–242. Iqbal K, Khan A, Khattak M. Biological significance of ascorbic acid (vitamin C) in human health – a review. Pak J Nutr 2004; 3:5–13. Hamza RZ, Diab AA, Abd El-Aziz EA. Hyperglycemic effect of chlorpyrifos, profenofos and possible ameliorative role of propolis and ginseng. Sci Agri 2014; 1:9–14. Baker HJ, Lindsey JR, Weisbroth SH. The laboratory rat. New York: Academic Press Inc.; 1979. p. 410. Altuntas I, Delibas N, Demirci M, Kilinc I, Tamer N. The effects of methidathion on lipid peroxidation and some liver enzymes: role of vitamins E and C. Arch Toxicol 2002; 76:470–473. Bancroft JD, Gamble M. Theory and practice of histology techniques. 6th ed. Philadelphia, PA: Churchill Livingstone, Elsevier; 2008. pp. 83–134. Cattoretti G, Pileri S, Parravicini C, Becker MH, Poggi S, Bifulco C, et al. Antigen unmasking on formalin-fixed, paraffin-embedded tissue sections. J Pathol 1993; 171:83–98. Ellman GL, Courtney KD, Andres V Jr, Feather-Stone RM.A new and rapid colorimetric determination of acetyl cholinesterase activity. Biochem Pharmacol 1961; 7:88–95. Aebi H. Catalase in vitro. Method Enzymol 1984; 105:121–126. Kar SM, Timsinha S, Agrawal P. An epidemiological study of organophosphorus poisoning at Manipal Teaching Hospital, Pokhara, Nepal. J Indian Acad Forensic Med 2010; 32:108–109. Ambali SF, Akanbi DO, Shittu M, Giwa A, Oladipo OO, Ayo JO. Chlorpyrifos-Induced clinical, hematological and biochemical changes in Swiss albino mice- mitigating effect by co-administration of vitamins C and E. Life Sci J 2010; 7:37–44. Khalil SM, Taha KM, Farid HE, Atia AF. Antioxidant role of olive 'Olea europeavar picual' leaves extract on profenofos induced oxidative stress in male rats. Int J Adv Res 2014; 2:635–650. Karasova JZ, Kassa J, Jung Y, Musilek K, Pohanka M, Kuca K. Effect of several new and currently available oxime cholinesterase reactivators on tabun-intoxicated rats, Int J Mol Sci 2008; 9:2243–2252. Lugokenski TH, Gubert P, Bueno DC, Nogara PA, de Aquino Saraiva R, Barcelos RP, et al. Effect of different oximes on rat and human cholinesterases inhibited by methamidophos: a comparative in vitro and in silico study, Basic Clin Pharmacol Toxicol 2012; 111:362–370. Raszewski G, Filip R. Correlation of therapeutic effect of obidoxime and dosing time in the acute intoxication by chlorfenvinphos in rats. Basic Clin Pharmacol Toxicol 2009; 105:37–45. Mansour MK, El-Kashoury AAI, Rashed MA, Koretem KM. Oxidative and biochemical alterations induced by profenofos insecticide in albino rats. Nat Sci 2009; 7:1–14. Colović MB, Vasić VM, Avramović NS, Gajić MM, Djurić DM, Krstić DZ. In vitro evaluation of neurotoxicity potential and oxidative stress responses of diazinon and its degradation products in rat brain synaptosomes. Toxicol Lett 2015; 233:29–37. Spodniewska A, Barski D, Ziółkowski H. Glutathione and glutathione-related enzymes in rats exposed to dimethoate and/or pyrantel. Pol J Vet Sci 2014; 17:105–112. Singh S, Kaur S, Budhiraja RD. Chlorpyrifos-induced oxidative stress in rat's brain and protective effect of grape seed extract. J Phytopharmacology 2013; 2:26–33. Sharma Y, Bashir S, Irshad M, Gupta SD, Dogra TD. Effects of acute dimethoate administration on antioxidant status of liver and brain of experimental rats. Toxicology 2005; 206:49–57. Yadav P, Jadhav SE, Kumar V, Kaul KK, Pant SC, Flora SJ. Protective efficacy of 2-PAMCl, atropine and curcumin against dichlorvos induced toxicity in rats. Interdiscip Toxicol 2012; 5:1–8. El-Hossary GG, Mansour SM, Mohamed AS. Neurotoxic effects of chlorpyrifos and the possible protective role of antioxidant supplements: an experimental study. J Appl Sci Res 2009; 5:1218–1222. Shrot S, Anaby D, Krivoy A, Makarovsky I, Rosman Y, Bloch-Shilderman E, et al. Early in vivo MR spectroscopy findings in organophosphate-induced brain damage-potential biomarkers for short-term survival. Magn Reson Med 2012; 68:1390–1398. Sofroniew MV, Vinters HV. Astrocytes: biology and pathology. Acta Neuropathol 2010; 119:7–35. Sofroniew MV. Molecular dissection of reactive astrogliosis and glial scar formation. Trends Neurosci 2009; 32:638–647. Abou-Donia MB, Khan WA, Suliman HB, Abdel-Rahman AA, Jensen KF. Stress and combined exposure to low doses of pyridostigmine bromide, DEET, and ermethrin produce neurochemical and neuropathological alterations in cerebral cortex, hippocampus, and cerebellum. J Toxicol Environ Health 2004; 67:163–192. Lim KL, Tay A, Nadarajah VD, Mitra NK. The effect of consequent exposure of stress and dermal application of low doses of chlorpyrifos on the expression of glial fibrillary acidic protein in the hippocampus of adult mice. J Occupational Med Toxicol 2011; 6:4–13. Liu C, Li Y, Lein PJ, Ford BD. Spatiotemporal patterns of GFAP upregulation in rat brain following acute intoxication with diisopropylfluorophosphate (DFP). Curr Neurobiol 2012; 3:90–97. Ho G, Zhang C, Zhuo L. Non-invasive fluorescent imaging of gliosis in transgenic mice for profiling developmental neurotoxicity. Toxicol Appl Pharmacol 2007; 221:76–85. Newairy AA, Abdou HM. Effect of propolis consumption on hepatotoxicity and brain damage in male rats exposed to chlorpyrifos. Afr J Biotechnol 2013; 12:5232–5243. Kunes JP, Cordero-Koning KS, Lee LH, Lynch SM. Vitamin C attenuates hypochlorite-mediated loss of paraoxonase-1 activity from human plasma. Nutr Res 2009; 29:114–122. Tsakaris S, Karika GA, Parthimos T, Taskaris T, Akogiannis C, Schulpis KH. Alpha-tocopherol supplementation prevents the exercise-induced reduction of serum paraoxonase 1/arylesterase activities in healthy individuals. Eur J Clin Nutr 2009; 63:215–221. Cao L, Chen R, Xu J, Lin Y, Wang R, Chi Z. Vitamin E inhibits activated chaperone-mediated autophagy in rats with status epilepticus. Neuroscience 2009; 161:73–77. Naseer MI, Najeebullah I, Zubair H, Hassan M, Yang BC, Kim KO. Vitamin-C protects ethanol induced apoptotic neurodegeneration in postnatal rat brain. Pak J Med Sci 2009; 25:718–722.